At first, before Earth "ended", I thought the book was comical and would be lots of fun; but once Arthur and Ford were catapulted into outer space, the storyline just became super nerdy. The humor was dorky and I had an extremely difficult time trying to find anything funny in it. The only reason I stuck with the book because it was only 142 pages long. 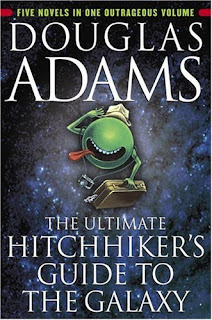 In fact, the only interesting parts were Adams' explanations on why dolphins and mice were superior to the human race. Maybe some hard-core nerds out there will love this book. I certainly won't be picking up the sequels.